The MT Push buddy chair is part of the all-terrain range by Mountain Trike. An adjustable push handle is located behind the user, which is where the steering and braking takes place by the rider’s buddy. The large front wheels, rugged chassis and air suspension are designed to allow the wheelchair to move over a variety of terrain including gravel, grass, sand, snow and mud. The Mountain Trike Company manufactures and produces all terrain off road wheelchairs from their UK premises. The MT Push buddy chair is suitable for children through to the adults. The Veldink Kiddo Up is an active lightweight wheelchair for self-drivers who sometimes need a tilt function. The wheelchair is constructed in such a way that the child is supported optimally. The tilt adjustment allows the child to adopt different postures for active use or upkeep comfort – thus reducing the pressure in the seating area. A wide range of options and accessories are available – from wheels and hoops to sitting supports. The colour, wheel protectors and back image designs can be personalised – designs are available on Veldink’s website or alternatively customised designs can be commissioned. Compact and lightweight by design, the wheelchair can be used from early childhood and is designed to grow with the child – the width, depth and height are all adjustable. Designed especially for children, the Qimova Comfort Paediatric Chair is a variation of their Comfort Chair. The smaller size wheelchair is designed to adjust and evolve as the child grows and their needs change over time. 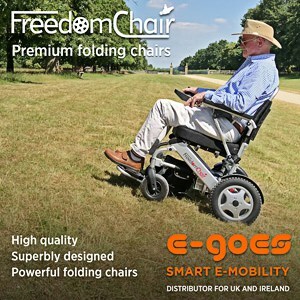 It comes equipped with extra short leg rests and recline and incline features on the back rest. The armrests and leg rests can be easily removed. A choice of seat sizes and bespoke cushioning is available along with a wide range of accessories that can be used to create the exact amount of functionality and support needed by the user. These include additional remotes and modules such as attendant remotes, sip ’n’ puff, finger steering and switch inputs as well as headrests, thoracic supports, hip guides, pommels, trays and pushing handles. The three-wheeled Alinker was created by Barbara Alink, a Dutch designer, architect and humanitarian, as an alternative to the more traditional style rollator. The walking bike is designed to help the rider maintain an active life, regardless of their movement abilities or disabilities. Due to the upright design, the user is at eye level with their standing companions when seated. The saddle carries the rider’s weight, leaving the legs free to move. Handle bars provide additional support. There are no pedals: the bike can be self-propelled forwards and backwards by one or both of the rider’s legs – this can make it suitable for use by those who may have limited use in one leg or amputees. The lightweight frame can be folded for storage or transport. The Krypton F is a fully adjustable folding wheelchair manufactured by Sunrise Medical. The frame is made from a patented carbon fibre, designed to be strong, rigid and lightweight. The folding cross-brace sits under the seat, giving it a minimalistic, open-frame feel. When the Krypton is folded, users can choose to remove the wheels or stow the wheelchair in a folded position. The fold-down back option provides an even more compact folding package. The Krypton F is part of Sunrise Medical Ltd’s Quickie range. A rigid frame version is also available. Karma Mobility’s VIP2 515 offers a combination of tilt-in space and reclining positions. The manual wheelchair features a 35-degree tilt and comes with either a backrest with fixed recline positions from -5-degrees to 15-degrees or an adjustable reclining back of 30-degrees. The pivot point of the chair is located close to the user’s hip joint, which synchronises with the motion of the body and the chair, reducing the sensation of sliding when reclining. The VIP2 comes with an adjustable headrest with a greater range of position options. Other features include a deeper seat for taller users, removable armrests, a tension adjustable backrest and the option to fit a rigid backrest for greater trunk support and comfort. Once folded down it will fit in the boot of most standard family sized cars. Comprising a strong aluminium frame, this four-wheeled lightweight rollator from Aidapt is designed to be durable enough for daily use. It has anatomically-designed handgrips, arthritic friendly loop cable brakes and height adjustable handles. Further features include an integral canvas seat, padded backrest and an integral walking stick holder. A detachable shopping bag is also included. When not in use, it can be folded down completely flat, making it ideal not only for storage but also transportation. The lightweight rollator is available in a range of colour options. When folded down, Blue Badge Co’s adjustable walking stick is small enough to pack into a handbag or large pocket. Made from lightweight aluminium, it boasts a strikingly coloured shaft, Canadian maple wood handle and rubber, non-slip ferrule. The height can be adjusted from 82cm to 94cm with 3cm increments between notches; once adjusted there is no need to adjust the stick height before folding it away. The Wheellator is a multi-function walking aid designed to combine the benefits of a rollator and a wheelchair in one device. Manufactured by Tukimet Oy, it is indicated for conditions such as COPD, MS, Parkinson’s and during rehabilitation after trauma incidents or planned surgery. The backrest is height adjustable and the large rear wheels with inflatable tyres are suitable for rougher terrain. If the user needs to rest during their walk they can turn the Wheellator around and sit down. The walking aid also comes equipped with push out height adjustable handles for times when attendant pushing is required. The wheels detach by pressing a quick-release button, helping to make it easy to pack away. The Wheellator Walking Aid comes in four colour options. Paediatric and bariatric versions will be launched in the New Year.